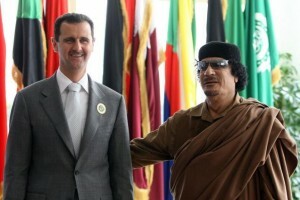 The 22-member Arab organisation also agreed to make contacts with the national council set up by rebels opposed to the regime of Libyan strongman Muammar Gaddafi in their eastern stronghold of Benghazi, diplomats said. The decision was adopted by nine of the 11 foreign ministers attending the meeting. Syria voted against the resolution. The other country that voted against it is Algeria , according to diplomatic sources. Syria‘s decision was not a surprise. Opposition sources said on Thursday that Syrian Air Force officers were flying some of the MiG-23 and MiG-25 fighter-jets ordered to attack rebel-held towns in Libya. They said at least one Syrian Air Force officer was killed and identified after his plane was downed. 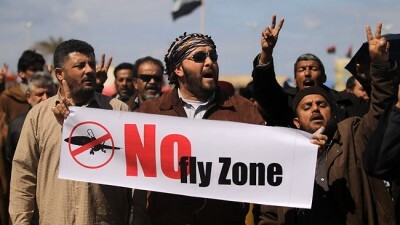 L Libyan protesters hold a placard in Benghazi calling for the implementation of the "No Fly Zone". Need proposals for negotiating a quick cease fire, political resolution, end of war. It’s not too important what the political situation becomes, as long as there is no armed conflict, the politics can improve. Even divide the cities into independent entities, and allow free travel, voting with feet. It is time for the UN and international bodies to discuss all situations of inflicting violence on civilians, or even threatening it, fomenting civil wars, denying basic necessities to populations. National sovereignty cannot continue to be a free pass to pillage a nation once power is attained. Graduated, varying levels of universal restrictions on all national leaders that abuse their population is needed.